We are a very small graphic design studio, providing traditional marketing communications services  corporate identity, product brochures, print ads, trade show displays, etc.  plus web site development and hosting, web ads and Search Engine Optimization. We are located in Long Beach, California. Michael Stanford, our founder and proprietor, does most of the design work around here, doing whatever it takes, from building web sites and concepting trade show graphics for security management software, to devising logos and laying out ads for automotive aftermarket companies. All in a day's work. But he's also been busy for the past few years getting into motorsports photography and automotive journalism, rounding out a career that has included AD stints in advertising agencies and design studios, teaching in university classrooms, photographing beautiful and fast cars, hanging out with car nuts and pinstripers, attending car shows, air shows and vintage races, and generally spending time not getting rich. As a photojournalist, specializing in custom paint and pinstriping, he has been a contributing editor to STREET RODDER magazine (look for his articles in the October and December 2005 issues, and the February, October and November 2007 issues). Michael is also the Southern California correspondent for AutoArt magazine, crafting stories for the only serious publication aimed at the custom painting and automotive art industry. From May of 2007 until 2012, Michael served as the the Art Director for STREET RODDER magazine, buffing and maintaining the image of this iconic car guy's magazine for parent company Source Interlink. He also provided art direction for Classic Trucks and Custom Classic Trucks magazines before returning to the freelance realm in 2014. Since then, he's been doing design and illustration work for Eddie Marine, Eddie Motorsport and various automotive aftermarket companies in the SoCal area. Hopefully as this site grows, we'd like to promote and celebrate custom painting and painters, advertise pinstripers events and products, and explore new ways to help car folks enjoy the art and culture of custom car design and decor. Please visit often to see how this is going. Proprietors Philosophy: A former pinstriper, sign painter and lifelong car guy, Michael has been shooting vehicles for 40 years, concentrating his interest primarily on custom cars and hot rods, race cars, antique cars and the odd motorcycle. The photographic subjects I like best are customized cars and hot rods, but I rarely shoot the entire vehicle. My images are compositions that I find in various areas of a custom painted vehicle. I try to capture the play of light, reflections, and textures that I find in the airbrushed, candy-colored and pearlescent finishes. "I've done pinstriping and custom paint myself as a youth, so this is an art form that has held a strong attraction for me over the years. Photographically providing a new way to look at this artwork is my creative contribution. 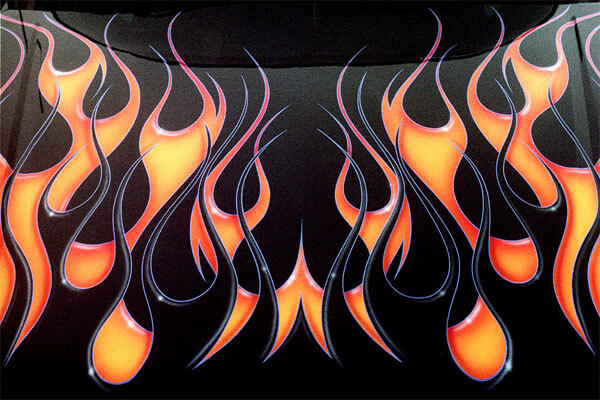 Through my pictures Im trying to bring to the viewer some of the visual excitement I experience when I look at an elegant pinstriping design, a perfect pearl fender or a wild set of flames. I really love this stuff. Viewed simply as abstract compositions, the images feature areas of vibrant, interlocking color and light, sometimes with very few clues to identify them as car parts. Richly colorful, they can evoke a range of sensory responses: a sense of motion, nostalgia, elegance, fear, whimsy, chaos. Mostly, though, theyre just really fun to look at.